Unmatched for fragrance and beauty in the garden, scented geraniums are undoubtedly showstoppers. With many to choose from, each with its own distinctive habit and fragrance, scented geraniums are also great for hanging baskets, window boxes or any type of container. Although the colorful flowers are small, the leaves of the scented geranium are the most spectacular part of this unusual herb. Rose Geranium: This cultivar has spicy rose-scented foliage with small clusters of pink flowers among the dark green leaves. Peppermint Geranium: This is a fast growing geranium that spreads to a 4-6 foot mound with clusters of white flowers appearing in summer. Leaves are lobed and medium green. This is a particularly good one for hanging baskets. Lime Geranium: This geranium shows off beautiful lavender flowers in summer and its leaves are serrated, round and light green. These can become quite bushy. Apple Geranium: Apple-scented geranium is another good one for a hanging basket. Clusters of white flowers appear on trailing stems and leaves are round and ruffled. 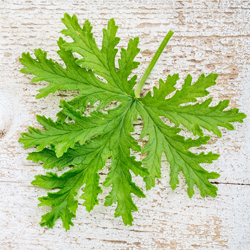 Lemon Geranium: This geranium has tiny purplish flowers and small wrinkled leaves. This one features a nice clean lemon scent that freshens a room quickly. Coconut Geranium: This plant has a trailing habit that works nicely as a ground cover or in a hanging basket. Its flowers are in small clusters and its leaves are round and dark green. Other popular scented geraniums include chocolate, nutmeg, orange, apricot and almond. Scented geraniums are not particular about soil, as long as it is drained – they do not tolerate wet roots well. These plants enjoy full sun and cool climates, with partial shade in warm areas. Pinching off end leaves will encourage bushiness to help keep a fuller, more compact form. The leaves can be harvested any time and used fresh or dried. One of the real joys of scented geraniums is harvesting the leaves and using their fragrance in a variety of ways. The leaves can be harvested at any time, and they may be used fresh or dried, though the fragrance may change somewhat or its potency may change as it is dried. Experiment with both fresh and dried leaves to find the aromas you like best. Scented geraniums can be used in some jellies, puddings, stuffing, punches, teas and vinegars. The oils in leaves are often distilled to make perfume, and the leaves make a sweet addition to sachets and potpourris. No matter how you use them, or even if you simply enjoy them in the garden, these lovely plants are sure to be a welcome addition to your garden and landscaping.